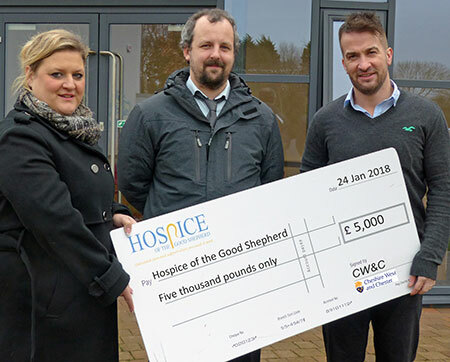 A cheque for £5,000 has been donated by Cheshire West and Chester Council to the Hospice of the Good Shepherd in Backford, Chester. The money has been raised through the recycling of metal retrieved by the Council’s Crematorium Team, following the cremation process. The recycling scheme is run with the consent of families using the crematorium’s services. The scheme is run by the Institute of Cemetery and Crematorium Management and crematoria throughout the UK take part. Charitable causes are nominated to benefit from the funds generated from the recycling. Councillor Karen Shore, Cabinet Member for Environment said: “We are delighted to be able to support the Hospice of the Good Shepherd with this donation. They are a valuable service in our community, providing end of life care to terminally ill patients and their families. Cllr Karen Shore, the Council's Cabinet Member for Environment; Marc Holden, from the Council's Cemeteries and Crematorium Team with Phil Crawford, Community Fundraiser at the Hospice of the Good Shepherd.